Since I’ve started doing Guidebooks for conventions, I’ve had access to all of the events run at a HMGS convention, and it usually shows up in convenient CSV delineated format. Since a burning issue that gets debated (usually within 24 hours of everyone getting home) is “game period x was overrunning this or game period y was under-represented”. I like to look at the actual numbers. So here we go! I didn’t include tournaments, as they are tracked separately– I have no idea how many actual events get played in any tournament. I may in the future but since I’ve started without them, I might as well continue without them. 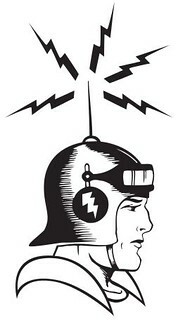 I don’t include any last minute addendums, walk ups, or any game run ad-hoc or open gaming at a show. My data is ONLY as good as the one time submission sent to me by Dan Murawski, early in October. 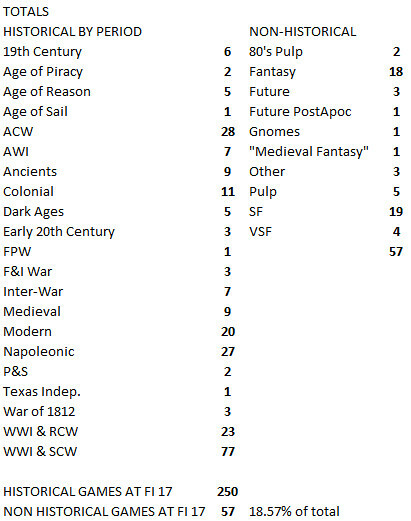 I classify games in two broad categories: Historical and Non-Historical, because, really, this is the heart of the matter for a lot of people– Is HMGS being overrun by non-historical games? However, you will see how I fit games into those categories easily enough. Some things are easy to classify, others, especial games that use “Other” as a period descriptor, are not. For the most part, these events follow the classic HMGS period descriptions we have been using since we started throwing conventions. Some of this is kind of fuzzy. Like, is “Age of Piracy” a big tavern brawl? What are “Other” period games? Is “Future” like.. NEAR future? Is an alt-history game a fantasy game? a science fiction game? If you split hairs to finely, your brain hurts. So here I was kind of conservative in classifying events, to give the data the benefit of the doubt. 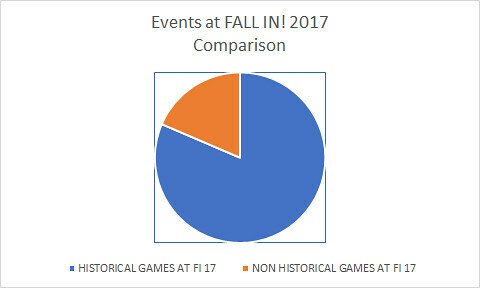 So, a little bit less than 19% of all events was classified as “Non-Historical” by me (and me, only). That includes fantasy, science fiction, post-apocalyptic, Pulp, Dieselpunk, cyberpunk, gnome-punk or whatever cutsie term you come up with. If it has a blatantly fantastic element, it’s on the right side of the data list. This is what that looks like with a pie chart. Hmmm.. doesn’t even look like a quarter this time, does it? The top 3 time periods are not very surprising. World War 2 and Spanish Civil War accounted for 77 (apologies for the typo, the last item in the list should read WW2 & SCW, not WWI). American Civil War games made up 28, and Napoleonic 27. World War 1 and the Russian Civil War trailed by only a few events at 23. Draw you own conclusions about trends. As I’ve said before when I post this.. you will really only have a meaningful trend after a dozen or so more conventions, I think. I can throw this out there: When you compare 2017 data to 2016 data, the results are almost identical. Historicon 2017, by contrast, was a few points higher. What’s that? 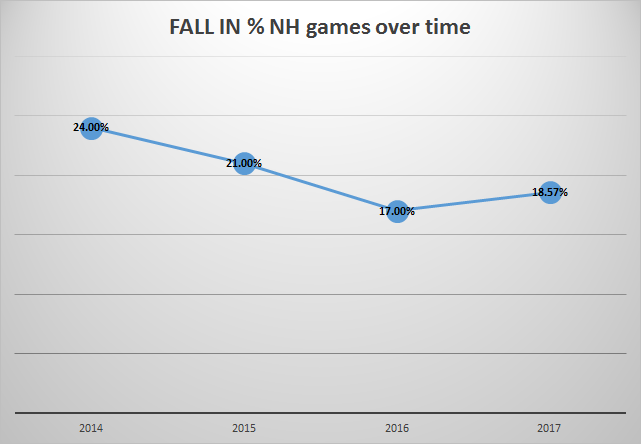 A seeming decrease in the number of Non-Historical games at HMGS conventions? It would seem to be (in a very general sense) to be heading that way over time. It’s way too early too say, but it’s interesting, nonetheless. so the old saying still holds up, “if it has Nazi’s, Nukes, Napoleon or ACW” it is a sure fire winner. I remember at one time there was no fantasy (or “other”) allowed at a HMGS con. And I remember the conversations about allowing “the other” in The Courier (among others). Do you know if this aprx 19% is a high or a low point of having non-historical in all these years? Roo: It’s about steady for Fall IN! (down slightly actually) and lower than Historicon, which is closer to 21% (but has an extra day’s worth of events). ahh, got’cha. thanks for the reply and good luck with the house moving in!